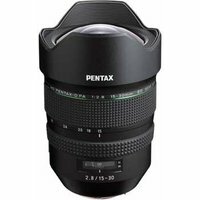 The Pentax FA 15-30mm f2.8 HD ED SDM WR lens is an ultra-wide-angle zoom designed specifically for K-mount DSLRs with full-frame sensors. Thanks to its exaggerated perspective typical of an ultra-wide-angle lens and high-resolution imaging power, it captures dynamic, sweeping views of subjects, especially in landscape photography. Its large f2.8 maximum aperture also comes in handy for photographing nightscapes and starry skies. The built-in SDM (Supersonic Direct-drive Motor) provides quiet, high-speed autofocus operation.